It has been a week now since Amtrak Train #188 derailed at speed east of Philadelphia, PA. The last week has witnessed endless speculation as the official investigation into the cause of the derailment continues apace. Those of us in the rail industry anxiously await the findings. Meantime, regardless of what the NTSB, the FBI and other agencies discover and conclude about the tragic wreck, there are a number of facts that are worth considering. 1 – It is roundly agreed by railroad executives, union officials and industry insiders that had Positive Train Control (PTC) been in place and in effect on this section of track, the wreck would most likely not have been possible. PTC would have resulted in a train brake application in order to slow the train, recognizing that its speed was excessive and therefore unable to negotiate the tight curve ahead. PTC has been mandated by Congress, but its complete implementation has been delayed on the Northeast Corridor and elsewhere for a myriad of reasons. In Amtrak’s case, one of these reasons is a lack of adequate funding from Congress. 2 – Amtrak has been underfunded for decades and forced to scrape by, cutting corners and deferring maintenance, even under the microscope by a budget cutting Congress more concerned with ideological purity and political expediency than with safety and security. On the busy Northeast Corridor where the recent wreck took place, Amtrak faces a backlog of drastically needed repairs to bridges and tunnels, obsolete rail interlockings, and trains that rely at times on 1930s-era components. Repairs for the Northeast Corridor are estimated at 4.3 billion over the next 45 years, while federal funding is expected to dwindle to $872 million. 3 – As a result of this constant pressure to reduce costs, on March 23rd, 2015, just six weeks prior to the wreck, Amtrak had unilaterally implemented a new scheduling arrangement for Corridor (NEC) train and engine crews over the vehement objections of its operating craft unions – the Brotherhood of Locomotive Engineers (BLET) and the United Transportation Union (UTU, now known as SMART-TD). The new schedule arrangements – designed to save the company $3 million by reducing scheduled layovers -- were condemned by both unions as a disaster in the making. Amtrak overturned a tried and true couplet system (trains paired out and back) for working crews in the NEC that had been in effect, with little modification, for decades. Prior to March 23rd, couplets adhered to the 90-minute layover minimum and took into account other factors including difficulty of the train in question, duration of trip, number and location of stops, timeliness etc. Now, not only has the 90-minute layover been scrapped, but crews have no guarantee of any break whatsoever! In addition, the new arrangement allows for a different on-duty time each day of the work week, and these start times are no longer restricted to within a few hours of one another -- they can be any time of the day! 4 – Simple technology has existed for nearly a century now that can aid and assist in preventing accidents such as this one. As with the wreck at Spuyten-Duyvil, NY on the Metro North railroad on December 1st, 2013, a simple transponder could have easily been located west of the curve that would have prevented the train from entering it at such an excess speed (in fact, such a transponder is in place on the approach to the curve in the westbound direction). This being one the tightest and most restricted curves on the corridor, it seems an appropriate location for such a life-saving device. Note: Since the above referenced MN wreck of, such a transponder has in fact been placed on the section of track leading to the 30 mph curve where that train derailed. 5 – Amtrak Train #188 – operated by lone engineer Brandon Bostian, entered the permanent speed restriction at the curve, rated for 55, at over 100 mph. Whether it was fatigue, the result of a projectile that hit the train, inattentiveness on the part of the engineer, or other factors at play, it is expected that the investigation will eventually pinpoint the cause. Nevertheless, there is the possibility that we may never know. But we know this: had there been a second crew member in the cab of the locomotive that day, it is very likely that such a second qualified crew member would have taken action to prevent the tragedy that – for whatever reason – the engineer at the controls was not able to avert. In the past half dozen years or so we have witnessed a series of tragic train wrecks, all of which have resulted in countless injuries and loss of life. Four wrecks – Chatsworth, CA (9/12/08); Lac Megantic, Quebec (7/6/13); Spuyten-Duyvil, NY (12/1/13); and now Frankfurt Junction, PA (5/12/15) have all been attributed to some form of “operator error”. (It is worthy of mention a factor that all four of these incidents had in common; i.e. the employee in question was working alone in the cab of the locomotive or was the lone crew member). While operator error may in fact be the case, simply pointing the finger at the worker does little or nothing to assist in understanding why the error was made in the first place; nor does it help us to prevent similar such wrecks in the future. Since workers are human beings and as such, are prone to make mistakes (regardless of how many rules are written up, what discipline may be threatened or how many observation cameras may be installed), we must implement safety features that take this reality into account and thereby prevent tragedies of this nature. 1 – The application of Positive Train Control (PTC) as soon as possible on major rail routes. 2 – In the meantime, application of off-the-shelf readily available technology at critical locations where passenger trains are particularly vulnerable. 3 – A minimum of two qualified employees – at least one certified locomotive engineer and one certified train conductor – on each and every train. 4 – A guarantee of adequate and proper rest, together with reasonable attendance policies and provision for necessary time off work, for all train and engine employees. 5 – Limiting the length and tonnage of freight trains to a reasonable and manageable level. 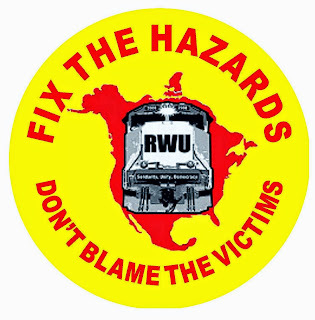 6 – The implementation of safety programs on all railroads that focus on hazard identification and elimination, rather than simply focus on worker behavior. 7 – Strengthening of OSHA “whistleblower” and other laws to empower employees to report injuries, workplace hazards and safety violations without fear of company reprisal. If we are serious about preventing future catastrophes of this nature, we must equip railroad workers with the necessary tools – including but not limited to those outlined above -- to enable them to perform the job safely. Pointing fingers at this or that employee (at any level in the company, union or management) might make some folks feel better, but it does little or nothing to prevent future accidents. Railroad Workers United believes it is time we learn from these terrible tragedies and get serious about implementing the necessary measures to ensure safe railroad operations.